Unicorn Magic Ornament | New 2019! Figurines | One Price Low Flat Shipping! 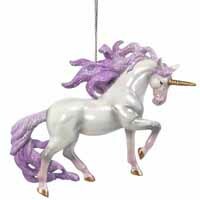 From the Trail of Painted Ponies 2018 Collector's Choice Ornaments Collection, Unicorn Magic 2.5" Hanging Christmas Ornament. Designed by artist, Melodi King. Made of stone resin. Measures 2.5" tall. Comes with hanging cord attached and packaged in collectible gift box.